If the price is fixed at a level below the lower border of the channel, the Advisor opens a Buy Stop order at the lower channel border. Take Profit is set near the upper border of the channel, and Stop Loss is set at the minimum of the current session, from which the channel width is subtracted. If the price is fixed at a level above the upper border of the channel, the advisor opens a Sell Stop order on the upper border of the channel. Take Profit is set in the lower channel boundary area, and Stop Loss is set at the maximum of the current session, to which the channel width is added. If the order did not work until the end of the session, then it is canceled. 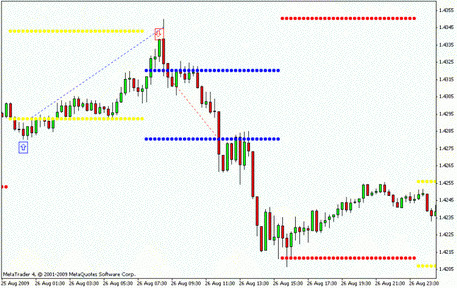 The recommended currency pair is EUR/USD; Timeframe - M15.